If you do not have a data backup solution, QuickBooks offers multiple products with an automatic data backup and recovery feature. To discuss if these products are right for you, please contact our sales team at 888-566-4671. If you need to email a copy of your company file, see Create or restore a QuickBooks Desktop portable company file. Switch to single user mode. (File > Switch to Single-user Mode). From the QuickBooks File menu, select Backup Company then Create Local Backup. On the Create Backup window, select Local Backup then click the Options button. On the Backup Options window that appears, click Browse and select the location for the backup copy. NOTE: It's a good idea to save backups somewhere other than your main local drive in case of a system failure. If you have a file hosting service (such as DropBox), flash drive or other removable media, you may want to select it here. When you have chosen, click OK.
Look over the other options on this page and select any that you like. Each option is explained in detail below. Click OK when you're done. Check the Add the date and time of the backup to the file name (recommended) to make it easier to distinguish between backup files. Check the box Limit the number of backup copies to this folder to and enter a number if you want to restrict the number of backups created for a single company. This can help save hard drive space. Put a check mark on the box Remind me to backup when I close my company file every _ times and set the frequency if you would like to receive a regular backup reminder. In the Create Backup window, click Next. You'll be prompted to choose a location to save your backup file. By default, it will be saved in the location you specified in the backup options earlier. However, you may choose a different location if you want. Select Save to create the backup file. 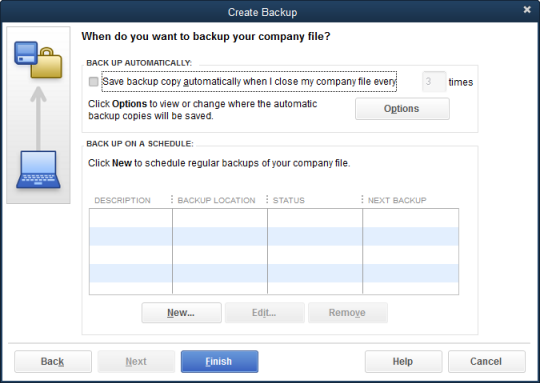 To save backups when you close your file, put a check mark on the Save backup copy automatically when I close my company file box. You can also choose how many times QuickBooks must be closed before you are prompted to make a backup. 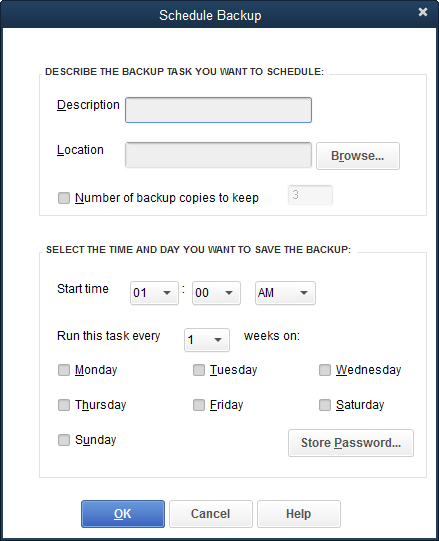 To save backups on a set schedule, click the New button to set up a backup schedule. You can give your schedule a description, specify a backup location, and set the options for what days and times the backup should be performed on. Click OK once you're satisfied. Click Finish when you're done. What is the purpose of the QBBackupTemp folders? The QBBackupTemp folder is a holding area for QuickBooks file components during the QuickBooks Backup (.QBB) file preparation process. This is a temporary folder that should get deleted automatically when the backup is completed. What would prevent a QBBackupTemp file from going away? The Windows user does not have delete permission on the file location. Windows will allow QuickBooks to create the temporary folder but won’t allow it to be deleted. If needed, please contact your system administrator to delete the QBBackupTemp folder or add Windows (user or folder) permissions. In some specific backup error cases, the temp (.tmp) folder may remain. In these cases you would receive a backup failure error message. Can the QBBackupTemp file be deleted? Yes, these are temporary folders which can be safely deleted. If you want to delete them, the folders are located at C:\Users\Public\Documents\Intuit\QuickBooks\Company Files. What gets saved in a backup? A backup file contains everything you need to re-create your company file and QuickBooks environment, including all of the QuickBooks files (templates, letters, logos, and images) related to your company file. QuickBooks also backs up your QuickBooks Statement Writer, Cash Flow Projector, Business Planner, and Loan Manager files if you're using these features. The backup file is saved with a .qbb extension. Can QuickBooks back up or restore data for a specific date range? No. QuickBooks backs up all data within a company data file. Can QuickBooks back up multiple company files at one time? QuickBooks only backs up the company file that you're currently in when you open the backup and restore wizard. To change the company file being backed up, open that company file first and then choose File > Create Backup. Do payroll tax forms get saved with backup? No, payroll forms are not included in the backup. Preferredmethod: QuickBooks recommends that you print a copy of your form and fax it to your accountant. If you are subscribed to QuickBooks Enhanced Payroll, you can archive a copy as a PDF and e-mail it to your accountant. Advanced method: If you need your accountant or bookkeeper to review and edit payroll tax forms you started and told QuickBooks you would Close & Save, you must send the folder that contains your saved form(s) along with your backed-up company file. Follow these instructions carefully to avoid losing your work and having to create your forms again. Go to the directory where you saved your company file. Look for the folder called "[Name of your company] Tax Forms." For example, if your company file is called "Sample Company", the name of the folder is "Sample Company Tax Forms." When your accountant or bookkeeper returns your company file to you, remind them to return the Tax Forms folder as well; otherwise, you will not receive any edits they made to your forms. 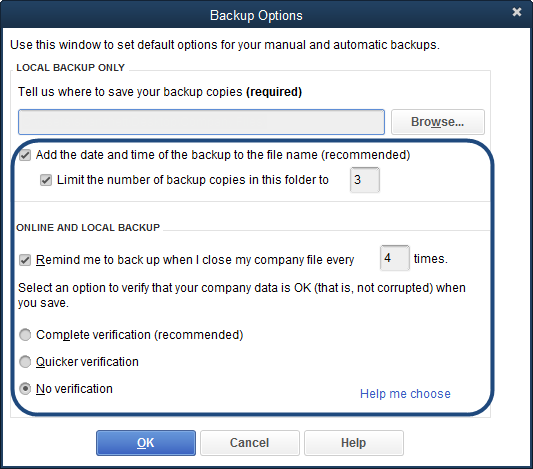 Can QuickBooks create a backup without setting options every time? Yes. If you've backed up once before and don't need to change any of your option settings, you can click Finish in the wizard at any time to back up using the current settings. Can QuickBooks merge a backup into another file? No. Backups can't be merged. If you need to exchange data with your accountant, consider using an Accountant's copy instead.